Hawaii conjures up images of island paradise, ocean breezes, beautiful sunsets, lovely flower leis, and amazing rainbows. Maybe you’ve been to Hawaii once, maybe you return to Hawaii year after year, or maybe you’ve yet to enjoy your first visit. One thing is certain though, when you visit Waikiki you’ll have a huge assortment of hotels to choose from. Hawaii, and especially Waikiki, is a wonderful destination. I’ve been reviewing Hyatt hotels for many years, and here’s my Hyatt Place Waikiki, Hawaii review. My favorite hotel on Oahu has long been the Hyatt Place Waikiki, Hawaii. I know what you’re thinking: really, a Hyatt Place? Yes indeed. 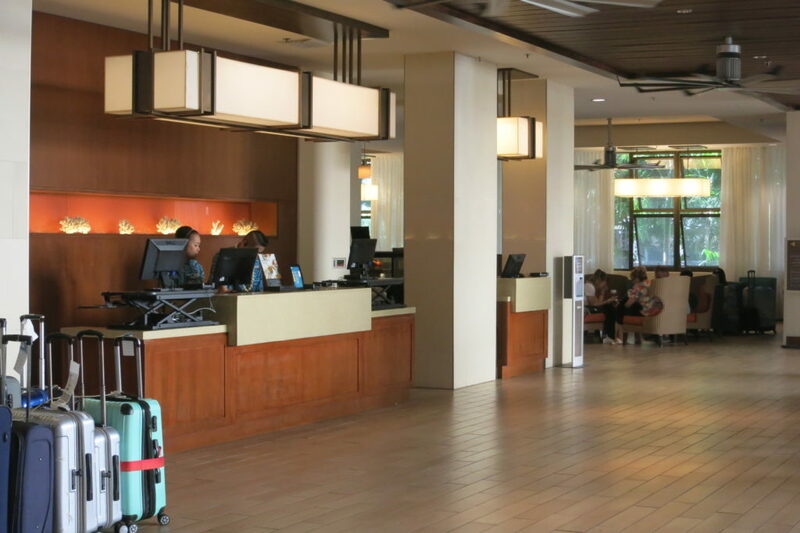 With this Hyatt Place Waikiki, Hawaii review I hope to show you why! First though, allow me to give you some backstory on this property. I sat down one morning and had a great talk with Ihab Kherati, the General Manager of the Hyatt Place Waikiki. He’s been with Hyatt for five years now. Kherati is one of the most hands-on hotel managers I’ve yet to meet, and I really enjoyed learning more about this property and how it’s managed. For many years this property was a locally owned resort with one tower. In 2011, Hyatt added the lobby and one other tower off the main lobby. After that renovation, the Hyatt Place became a franchise property flying the Hyatt flag. The property is owned by Host Hotels and managed by Kokua Hospitality, a large hotel and resort management company. One of the features that makes this Hyatt Place different from all other Hyatt Place properties is the many different room categories. Guests have a whole host of room options to choose from. Another feature that differentiates this Hyatt Place is that ALL the rooms have pull-out sofas. The room categories are: standard city view king, mountain view standard, ocean view with either king or queen beds, premium rooms which are larger, and specialty rooms which can accommodate up to 6 people. The specialty premium rooms with two queen beds are super popular during the summer months when kids are out from school and families head to Hawaii. A big part of your room choice will be based on either how many people will occupy the hotel room or whether or not you’re willing to pay a bit extra for the view. Space vs. view is often a choice dilemma at properties such as this Hyatt Place. It is, after all, Hawaii, and who doesn’t want a great view of either the ocean or the mountains? At 426 rooms this is by a wide margin the largest Hyatt Place property. At the Hyatt Place, year-round occupancy runs high at 92%. I talk with hotel management at every hotel I stay at and 92% year-round occupancy is the highest number I can recall. The guest profile is interesting as well with 10-20% of the hotel guests being Hyatt members. The largest guest groups are from Asia, including teams and groups of kids that come to Hawaii for sports. It’s also true that American kids stay here in large numbers with their traveling sports teams. I’d say it’s a very family and kid-friendly property. If you’re a World of Hyatt member, a large breakfast buffet featuring both Asian and western style foods is included with the room. Otherwise, for a reasonable price, guests can purchase breakfast. I noticed on my last stay that there seemed to be improvements with the buffet breakfast offerings. And I was right. As explained by Mr. Kherati, as of December 2018 they had indeed made some improvements. The Hyatt Place now uses cage-free eggs, nothing but the potato medley which is served every morning with garlic pesto is cooked in oil, bread is fresh and delivered daily, peanut butter is now the real deal instead of the processed nut butter, and the yogurt is Greek style yogurt. There really is nothing lacking at the breakfast buffet. The crowd is large and it’s a very busy and hectic breakfast buffet. How busy is it? Glad you asked! They serve between 1200-1400 guests a day. I’m impressed! The hotel does provide trays in each room should you want to bring your breakfast back to your room. They also will serve you breakfast (except for the Asian offerings) in the lobby when the breakfast poolside area gets too busy. For my stay I used World of Hyatt points. The Hyatt Place Waikiki is a World of Hyatt Category 3 property, meaning free nights start at 12,000 Hyatt points per night. Because of its location, the Hyatt Place can be an expensive Category 3 property, so it’s also a great choice for your World of Hyatt free award night certificate that comes with your yearly renewal on your Chase Hyatt credit card. The all-cash rate for my stay was $256 per night. I’ve seen rates as high as $300 a night, and during the holidays and high season even as high as $550 a night. Remember, if you’re paying cash for a hotel stay, let Pruvo monitor your rate for price drops! I had a nice surprise at check-in. Because of the high occupancy at the Hyatt Place, I never know, even given my Globalist status with Hyatt, if I’ll receive an upgraded room. I was indeed upgraded to a high floor ocean view room, which as you can imagine, made my stay extra special. I received a plate of fresh fruit as my welcome amenity and two large bottles of water were waiting for me in the fridge. Using my Hotel Room Scorecard I broke down the individual elements of my Hyatt Place Waikiki Ocean View High Floor room, which scored a 35 of 40 points. Waikiki is essentially three blocks deep from the ocean to the Ala Wai Canal as the northern boundary. From east to west, Waikiki is a few miles long. When you choose a hotel, besides choosing a brand, you’re choosing a location within this densely populated area. My preference is the Diamond Head end of Waikiki, so for me the location of the Hyatt Place is perfect. It’s near the zoo, the aquarium, and Kapiolani Park. I enjoy hiking up and around Diamond Head. If like me you walk a lot, the walk to Ala Moana Mall, the main mall on Oahu, is an hour away. The rooms have beautiful natural light coming in from the large lanai with sliding glass doors. Except for the entry way and bathroom, there is no overhead lighting. However, throughout the room there are well placed lamps, as well as a floor lamp alongside the couch. Because I work when I travel, I need extra light in the room and requested a second floor lamp. This was not an issue, and within a few minutes of my request an extra floor lamp was delivered. Just one of many examples of the excellent guest services at the Hyatt Place. In Waikiki there is no such thing as a street that isn’t busy with car, bus, and general street noise. Nonetheless, you’ll still want to open your sliding door to either sit out on the lanai (patio), enjoy whatever view you have, or simply let in some fresh air. The hotel is two blocks off the beach but still right in the thick of it. Yet with the doors to the lanai closed, it was amazingly quiet. I can’t speak about the noise level on the lower floors though, as I generally take a higher floor room. There are two levels of curtains for the sliding doors, one for sun/privacy and the other for black-out darkness. The bed was a bit too soft for me. When in Waikiki I average 8 or so miles of walking each day, which means that bed too soft, bed too hard, makes no difference. I sleep just fine. The bathroom is just off the entry way. The bathroom is a bit on the small side, with a sink area and then a separate toilet and shower area. There were enough hooks and racks for towels. I had a great surprise when I looked at the toilet: it was a Toto Washlet bidet! If you’ve read any of my other hotel and room reviews you’ll know I’m a huge fan of Toto Washlets. While I’ve come to expect them in hotels throughout Asia, this was the first time I’ve seen one in a hotel in the U.S. The backstory as told to me by the Hyatt Place General Manager, Ihab Kherati, is that due to the large numbers of Asian tourists choosing the Hyatt Place for their visits to Waikiki, the Hyatt Place changed out the toilets to Toto Washlets in some of their premium higher floor rooms. Hyatt also added hand-held showers in these premium rooms. Good call, Hyatt Place! I do prefer wood floors and often in Hawaii, because of the weather, carpet can get musty and moldy, but that was not the case at all at the Hyatt Place. Except for the bathroom, the room was fully carpeted. The carpet was in great shape. There were only two pieces of artwork on the walls. Given that everyone’s taste in art is so different, I prefer staying in hotel rooms with as little artwork as possible. There was a full sized desk in a separate office-like workspace with a comfortable chair and desk lamp. In the living space opposite the bed there is a pullout couch and ottoman. One good feature to note about ALL the rooms at the Hyatt Place is that all the couches pull out into beds. The couch was comfortable and in good shape. Ottomans in a hotel room are one of my favorite design features. I find ottomans useful for many things and never understand why hotel rooms that have the space don’t include them. Along the wall next to the bed is a long dresser with the TV on top. There is also a rather spacious refrigerator. The rooms have a lanai with two chairs and a small table in between. 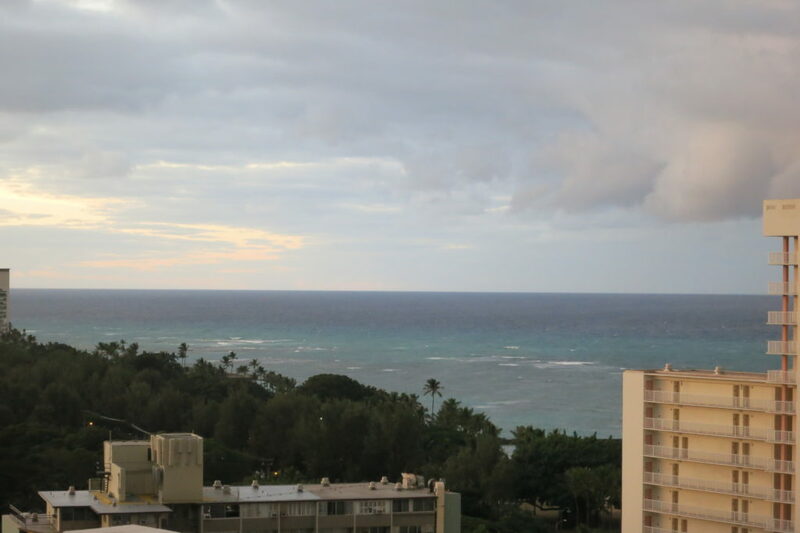 Though ocean views in Waikiki are often blocked by buildings, my room had an unobstructed ocean view. Lovely to see the morning light as well as the sunset. Plugs and outlets were plentiful and well-placed throughout the room. There were outlets near the beds and universal plugs and USB charging ports at the desk. As I mentioned, the fridge is roomy and big enough for whatever you might want for drinks or snacks. Counter space is lacking because the TV screen and a lamp take up most of the space on the dresser where you might want to keep snacks and drinks that don’t need to be kept cold. There is an empty corner in the rooms with a full length mirror on the wall. This would be a great space for another cabinet which would provide surface space for beverages and snacks. 1. Getting to and from the airport to Waikiki can be expensive. However, Hyatt Place Waikiki has worked out a special deal for their guests with Charlie Taxi. The rate is $29 and is a special flat rate. I’ve used Charlie Taxi a number of times and can for sure recommend them. 2. It’s great when hotel management is both creative and proactive in helping guests navigate the issues that will inevitably arise during a hotel stay. The Hyatt Place does a fantastic job heading off complaints ahead of time. For example, guests most frequently complain about the slow elevators. The second most popular complaint is that, especially during the summer months, there isn’t adequate seating at the breakfast buffet. In order to handle these two issues, you’ll receive a red/green/yellow timing sheet informing you of when the elevator and breakfast hours are the busiest. Pay attention to this sheet because having stayed at the Hyatt Place many times, I can attest to its accuracy. 3. There are destination fees at the Hyatt Place. In exchange for those fees guests receive the usual amenities such as beach towels. However, should guests need them, the Hyatt Place also provides beach chairs. Nice touch, Hyatt Place. 4. Need coffee or tea but don’t feel like dealing with breakfast crowd? In the morning, head to the hotel lobby and you’ll find coffee and tea available. I can’t help but mention the service at this hotel because it really does tie into my being so impressed with the Hyatt Place Waikiki. You’ll recall I asked for an extra floor lamp. No problem. Housekeeping is quick and helpful with whatever they can do for you. This is a busy property, yet there’s always plenty of staff around when you need them. The general friendliness of the hotel team is impressive. On occasion I would ask other guests in the elevator three questions: was it their first stay at this hotel, were they having a good experience, and would they recommend this hotel to their friends. While these people were an impromptu and random sample, everyone told me they would recommend the hotel. In a few conversations the guests even started telling me all the wonderful things the staff did for them. Nice to hear since this is my regular home when in Waikiki! The Hyatt Place Waikiki is a great value, especially using free award nights combined with World of Hyatt points. For WOH members, breakfast is included, making the hotel an even better deal. I’ve stayed in many of the different room categories and the rooms work really well for me. There are other Hyatt properties in Waikiki, with a Hyatt Regency in mid-Waikiki and a Hyatt Centric towards the Ala Moana side of Waikiki. That being said, the location, amenities, and exceptionally attentive staff puts the Hyatt Place Waikiki on my absolutely would-stay- here-again list. I hope you’ll get to experience Hawaii and the Hyatt Place Waikiki for yourself! Hi Robert, Very true. The Hale Koa has a great location. I noticed their beachfront pool area is going through a major renovation. Should be grand by the time it’s done. Thanks for reading! Love this review! It was so thorough. Thank you. I like softer beds and find Asian hotel beds to be too firm for my comfort, so I am pleased to see that a hotel that caters to a large Asian tourist population still has softer beds. Makes it a must try hotel option next time I go to Hawaii. Thanks so much for reading, Lara, and taking the time to comment. Glad you found the review helpful. There are many hotel options in Waikiki, but this one is definitely worth a stay whether you’re a Hyatt loyalist or not. That’s strange, Ray. The GM mentioned all the rooms having a pull-out couch. I’ll check with him again. Good to try different properties within a brand. The stay at the HRWB will be quite different as the property itself is so different. Let us know what you think after you stay there. Thanks for reading and taking the time to comment. Hi Ray, I did check with hotel management and you are correct. In 2016 to create more space in some rooms, there were some bedding changes in 18 rooms . The pull-out sofas were replaced with only single couches. Those would be the standard CITY rooms. Sorry for the miscommunication and thanks for keeping me on my toes. Agree on the points value, Ray. I don’t give up my Hyatt points too easily, but this exchange was well worth it. I’ll keep your east coast ocean front HP’s in mind. Thanks for the recommendations! What I had experienced at this hotel was dramatically different: hotel room issues, service failures and blatant lies from hotel management. We became so upset that we eventually had to complain to Hyatt before the hotel did offer a very reasonable compensation of almost 170K pts. But still, these pts cannot buy back our lost vacation time and the nightmare experience we had to go through. That all sounds awful, John. Sorry to hear. I get your frustration as I’d be upset as well if that were to happen during my stay at any hotel.